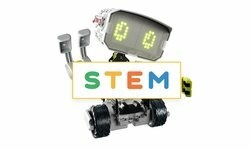 Every year STEM toys are becoming more and more popular among children and their parents. The reason is obvious: these toys are fun, educational and engaging to play with. Scientific and technological development influences our everyday life greatly. So, while scientific progress is accelerating, STEM toys are catching up! Last year has been quite eventful for key science and technology sectors. Like, did you know that a half-artificial organism is already living near us? By using a six-letters genetic code, scientists have developed a new form of life! Isn’t that amazing? Therefore, we need to prepare the ground for the next generation, so that children of today will continue making our world a better place. That’s why between assembling another Artec kit, shooting the Ecobot Android car review and taking our nimble robotic lizard for a walk, we have undertaken our own research and prepared our rating of the best STEM toys of 2017. Kano Computer is the laptop making kit, based on the popular Raspberry Pi 3 Model B board. Its assembly is easy and fun, just like playing the LEGO construction set. According to the inventor of this amazing kit, modern children want not only to consume but also to create. Well, we couldn't agree more! The main advantage of this construction toy is the possibility to develop your own programs, which will be working perfectly well. Kano is the ideal gift for the future Bill Gates, without a doubt. This construction set is designed to please the most devoted Star Wars fans. Droid Inventor Kit allows all budding inventors to create their own interactive R2-D2 Droid. Besides assembling the robot, kids can customize it according to their preferences. Put all parts together and take R2-D2 on a mission! Use the app on your iOS or Android device to control your robot. Droid inventor kit is compatible with other littleBits sets. Don't you miss the opportunity to add more fun to the game by including other littleBits awesome construction sets. In case you have no littleBits, please click here and choose your first one. It is a fascinating and effective way to plunge into the world of programming, electronics and the popular franchise. littleBits construction sets occupy a significant place in the ratings of the 2017 best STEM toys. They are easy to use, safe, and multifunctional. Their main feature is that all brand kits are compatible with one another. Thus, you can expand the functionality of each kit by connecting it to another one! We’ve already told you about littleBits in one of our previous ratings, but they are too good not to speak about them one more time. Despite the fact that Arduino Coding Kit seems to be too sophisticated, it functions quite simply! Any 8 –year old child (and older) can deal with it easily. The kit contains everything you need to learn the basics of electronics and programming. With the Arduino controller and seven popular Bits form factor modules, a kid can immerse into the Arduino programming jungle at ease. Doesn’t require soldering. Turn yourself into Mister Geppetto with this tiny but smart robot! Dash Robot Wonder is smart: it has personality and intelligence. The toy is controlled via an iOS or Android device. It’s capable of a lot: it can light up, move and make sounds, but there’s much more than that. There's a Blockly app! Blockly has a simple interface and allows players to extend the functionality of the toy. You can also program it to react to certain events in a way you want to. That’s what makes Dash so unique to play with. But there's more to come: children over 12 have the possibility to create their own apps on iOS and Android using Objective C and Java. Human Body Model is a toy to make studying anatomy easy and fun. The value of such toys can hardly be overestimated. The kit includes the human anatomy model, plastic tweezers, and forceps, the instruction sheet, and the colorful poster with the images of all organs. Human Body Model would be great for anybody who aspires to learn biology and will become the perfect starting point for doing that long before the school starts. The human body is a complex biological system, and modern anatomy science kits are a great way to satisfy kids’ curiosity and show how the human body looks like inside out. Electronic Snap Circuits Jr. SC-100 is intended for teaching your child the basic principles and rules of building chains. The construction set would be perfect for inventors aged from 8 to 109, and this is its biggest advantage. Parents can join their children to learn new things! We sincerely believe that it’s never too late to study, don’t you think so? The kit includes a bunch of details, which allow building a wide range of unique structures. Among them are AM radios, burglar alarms, doorbells and much more. Players have more than 100 different variants of electronic devices to create! The construction set provides a lot of fun, educational benefits, and visibility, we promise. Kits that are similar to Thames and Kosmos Physics Workshop are must-have to all budding inventors. What makes this kit so special? It contains more than 300 details to immerse a kid into the world of engineering and explain the main principles of mechanical physics! Children can build many moving and static models: windmills, two-speed cranes, force scales, sail cars, mars robots, hammer machines, centrifuges, and even a pinball game! We should say that our list contains the smallest part of all the models that you can build. That’s what makes it an ideal toy to learn physics basics. Don’t you want to add a little of magic to your daily routine? It wouldn’t be a problem if you have Scientific Explorer Magic Science for Wizards Only Kit! Little babies are also a kind of discoverers, but what they discover seems to be usual things for us, adults. We offer you to help your child to preserve that feeling of astonishment about new things by giving him this kit. Scientific Explorer shows us that science can be amazing and magic, and gives all budding wizards an opportunity to create a miracle at home. There are nine options to have fun, each of which explores a certain chemical reaction. Bring a little magic into your lives, and all the foamy and color-changing potions will come to life! Can you imagine a four-year-old girl to be an engineer? We believe it can be true with this awesome The GoldieBlox kit. GoldieBlox and The Spinning Machine makes engineering fun for the youngest of us. The main characters of the story are Goldie and her dog Nacho, and they’re facing a difficult problem. Therefore, our task is to help them find a way out: to build a spinning machine to assist Nacho to chase his tail. This kit develops spatial skills and confidence in solving problems. GoldieBlox and The Spinning Machine contains a storybook, five animal figurines and many details for assembling an unlimited number of models. Dilute the learning process with a dose of fun! National Geographic Break Open 10 Premium Geodes praises the science of land, geodesy, and invites you to join. The kit includes everything you need: ten first-class geodes from five different mines around the world, safety glasses, a stand and a colorful guide. The world of crystals becomes more accessible for study and understanding. You can discover many awesome things while examining the kit: quartz, calcite, pyrite, and amethyst! You will need a hammer and a little determination to enjoy the research process to the fullest. While the most modern technologies in electronics are still inaccessible to mere mortals, we have the opportunity to build our own 4 feet tall robot! It won’t be easy and it will take some time, but the final result is definitely worth it. You will get a trained robot that is able to simulate your actions and execute your commands. The kit contains 1200 details, including the brain, LED eyes, and eight motors for realistic movements in arms and head. There are two ways to control the robot: by using your iOS or Android device, or you can train Meccanoid through direct manipulation. The latter option is much simpler and offers/features many voice commands that you can use. Although the trend for STEM-toys has already gained popularity among people of all ages, we believe that the best is yet to come! Stay in touch to be aware of the most progressive Robots, Science & Experiments kits, electronic construction sets, 3D puzzle models, and kits for programming and coding. There’s no doubt that 2018 will please us with more wonderful toys. Follow us on Facebook page and never miss the most interesting from the STEM world.